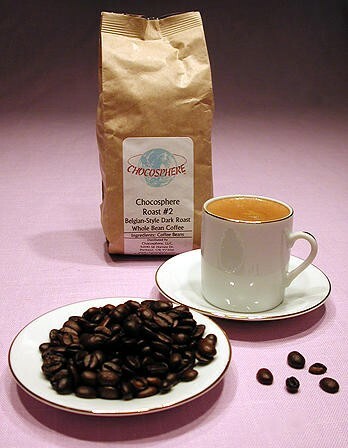 When our "Belgian Connection" brought us the chocolate that led to the creation of Chocosphere, he brought something else too – the most wonderful dark-roast coffee beans. These beans made delicious espresso drinks and European-style coffee. Imagine our disappointment when the Belgian roaster refused to export our favorite coffee to the U.S! So, we contacted a nearby artisan coffee roaster, gave him an unopened bag of the beans and asked him to duplicate the flavor as closely as possible. The result? Chocosphere Roast #2! Why "#2" you may ask? Because our roaster gave us three alternatives, and we chose bag #2. But make no mistake about it, this coffee is second to none!